Fountain grass is a hugely popular ornamental grass, but sometimes it is just too big for the location you have, or for the size of your garden. 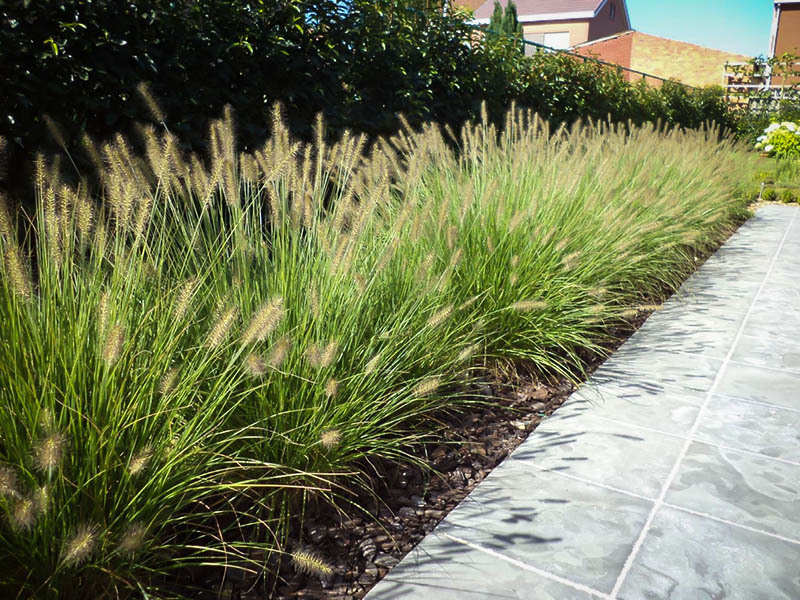 For that there is Dwarf Fountain Grass, a full foot shorter, but just as beautiful. 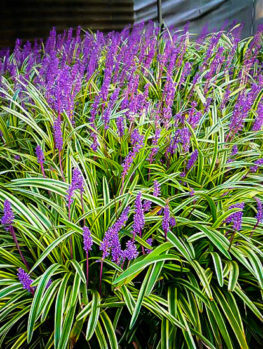 This easily-grown grass grows just 18 to 24 inches tall, so it fits perfectly into smaller spaces and containers. In larger gardens too, it is ideal for edging beds and paths, where a shorter plant is needed to achieve the right scale and balance. It forms an arching clump of narrow leaves, topped by abundant seed heads with bottle-brush clusters at the end, making a beautiful fountain of foliage and stems. The seed heads begin pinkish-beige, and turn golden by fall, looking beautiful in the low sun of a fall day. You can grow Dwarf Fountain Grass in any sunny spot, in almost any kind of soil that is not constantly wet. 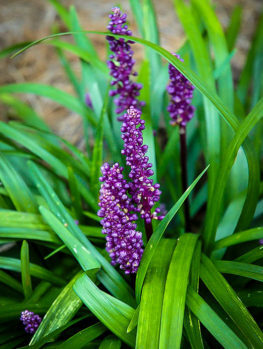 It begins to bloom a full two weeks before its larger parent, so it is ideal for cooler zones, where otherwise flowering will only happen late in summer. It is the perfect size for containers, and it looks beautiful alone or with flowering plants mixed with it. This plant is hardy from zone 5 to zone 9, so it grows almost anywhere. In colder areas it may not overwinter, but it is so fast-growing that it can be grown as an annual. Dwarf Fountain Grass is the ideal choice for an ornamental grass for smaller gardens, or where something lower-growing is needed. This smaller form of the popular fountain grass is not only smaller, but it begins to form blooms a full two weeks before the larger form, making it ideal in areas with shorter growing seasons. So if you live in zone 5 this is a superior choice to our standard Fountain Grass, unless you really must have that extra foot in height. This is also a terrific choice for planters, urns and pots, where the more compact size is often preferred. 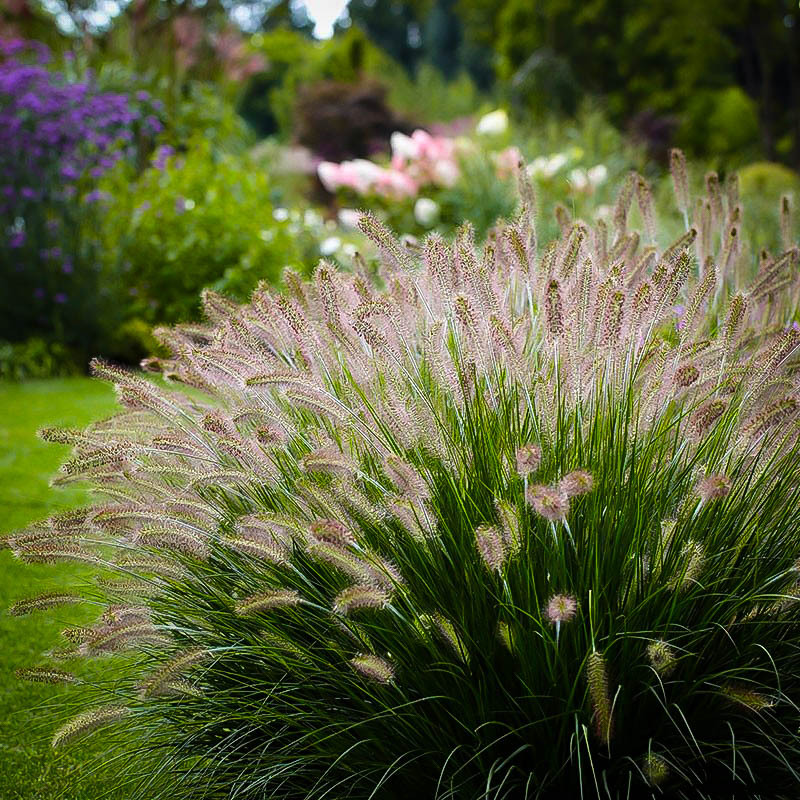 Fountain Grass, Pennisetum alopecuroides, grows naturally from Japan to Australia. The variety ‘Hameln’ was developed many years ago, and is a consistently dwarf form, produced by division of established clumps. Seedling forms will not have the correct dwarf habit of this plant. Our plants are true to the size indicated. 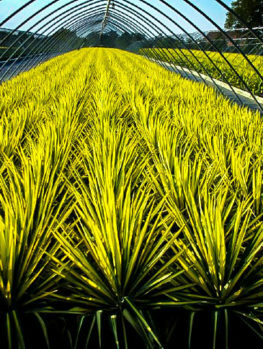 This is perhaps our most popular ornamental grass, so don’t hesitate, order now while we can still satisfy your order. Dwarf Fountain Grass forms a dense clump of foliage, never spreading or taking over as some grasses do. The mid-green leaves are narrow – less than ½ an inch wide – and they sprout upwards, then arch over, creating a lovely effect even before the seed heads emerge. These begin to rise above the leaves by early summer, and many appear, making a fountain of beauty. Each stalk has a fuzzy bottle-brush several inches long on the end, beginning pinkish and then turning to shades of soft yellow and golden straw, as the seasons pass, and summer is followed by fall. Even into winter this grass remains attractive, and the leaves turn beige as the colder weather arrives. Every breeze causes the foliage to sway and rustle, giving that unique effect that only grasses give us. 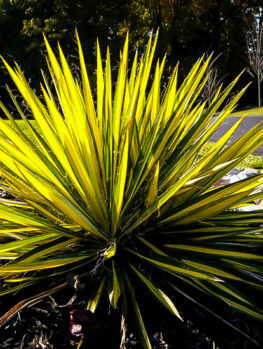 The foliage grows to around 18 inches in height, and the whole plant in flower is about 2 feet tall. 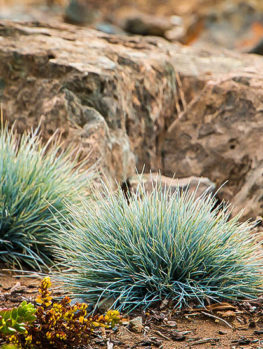 Dwarf Fountain Grass is the ideal ornamental grass for smaller gardens. It is large enough to have a real presence, and to bring the beauty of grasses into a small space, yet it is small enough to balance with the space, and not overwhelm it. In larger gardens it is just as useful. We often want a lower plant for the foreground of a planting, and for edging beds of larger plants, and the scale of this plant and its light, airy look is unequalled. Plant it as a row along the edge of a bed, remembering to set it back far enough that you can edge a lawn without damaging it. 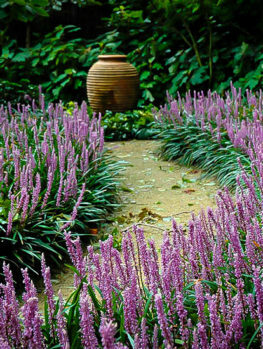 Use it for a low border along a path or driveway. Plant it as a barrier between a terrace and the garden, or between one part of the garden and another. Scatter individual plants, or groups, among flowering plants and shrubs. Anywhere you have a gap to fill, this is an ideal plant, as it fits perfectly with every other kind of plant, no matter what its foliage is like, or what color its leaves or flowers are. 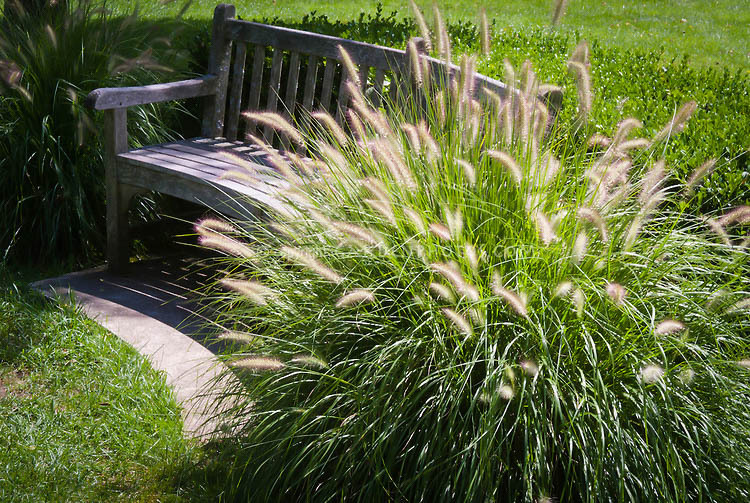 As a grass for containers and planters, Dwarf Fountain Grass is unequalled. It is just the right height and breadth for typical large pots and planters, allowing room for other plants around it, or filling a smaller planter completely, for a simple, low-maintenance but very effective look. Plant a pair of urns on either side of an entrance with this grass – nothing more is needed for a stylish and elegant effect. For more lushness, surround it with trailing annuals. Always use a container with drainage holes, and water when the soil has become moderately dry. 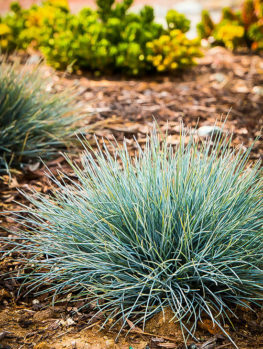 Dwarf Fountain Grass grows best in full sun, but it is also tolerant of a little shade. It will grow in almost any soil, except for wet ones, and grows vigorously even in poor soils. Some fertilizer will encourage rapid growth in the early part of the year, but this plant is very easily grown without any fussing or complex care needed at all. This is a fast-growing plant, and new plants in spring will be full-size by the end of summer. Water your new plants once or twice a week while young, but once it is established it needs little or no attention to thrive. This plant has no pests or diseases of any importance, and deer normally do not eat it. If you live anywhere from zone 5 to zone 9 you can grow this grass for years. It will grow in colder zones, but it may not over-winter. Since it grows very fast, gardeners in cooler areas treat it as an annual, re-planting each year. In late winter or early spring, cut-back to 3 or 4 inches tall. It takes at least 2 weeks of warm weather for this grass to begin to re-sprout, so don’t assume it has died. Once new growth begins it quickly fills out, and your plant will be even more vigorous than the year before. Do not try to move or divide it before new growth appears, as this can easily kill it. 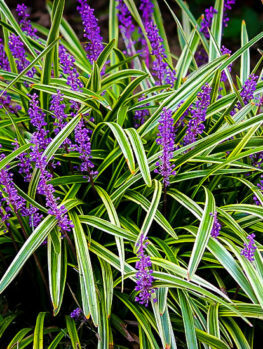 That annual trim is all the care needed for this great plant – a very low-maintenance way to garden.